The big striker will be lining out for Wycombe Wanderers this season. WYCOMBE WANDERERS HAVE signed ‘The Beast’ Adebayo Akinfenwa on a one-year deal. The 34-year-old cult hero, who has lined out for 12 professional clubs in his career, helped AFC Wimbledon secure promotion to League One via the play-offs last season but left in the summer after his contract expired. 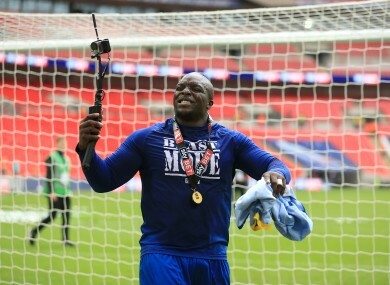 After that win at Wembley, Akinfenwa encouraged interested managers to “hit me up on WhatsApp and get me a job”, and now League Two outfit Wycombe have announced his arrival. “Everybody knows what Bayo is about and I’m so excited to have him here because he’s the right signing at the right time for us,” said Wycombe boss Gareth Ainsworth. “I believe that bringing Bayo to the club shows our intent to give it a real push to go bigger and better than what we achieved last season. “With Dayle Southwell, Paris Cowan-Hall and Myles Weston also coming into the club this summer, I’m delighted with the way we’ve been able to strengthen our attacking options and I know this signing in particular will get people talking. Bayo has had a phenomenal career and still has plenty to offer, not just on the pitch but also in the changing room because of his character and real leadership qualities. Email “Somebody has finally hit Adebayo Akinfenwa up on WhatsApp ”. Feedback on “Somebody has finally hit Adebayo Akinfenwa up on WhatsApp ”.